Cheque Factory is an friendly piece of software that allows you to easily create invoices, bills, checks, labels, memos and other types of documents using templates. To create a new item, the program offers a wizard to simplify the process. To begin with, you need to fill in bank information, currency, and document orientation. Then, you can set the position of multiple placeholder fields on the document once you define them, add photos, shapes, lines, text boxes and other elements, edit the background image and use barcodes among other options. 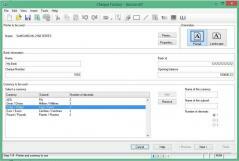 Once you’re done customizing the layout, you can load data from various sources like XLS and CSV files, as well as Access, FoxPro and MySQL databases. The project can be exported as a PNG, JPG or BMP image file.